I've never been a particular fan of Bible storybooks or toddler Bibles. See, nothing can quite compete with my memories of my own childhood Bible storybook. 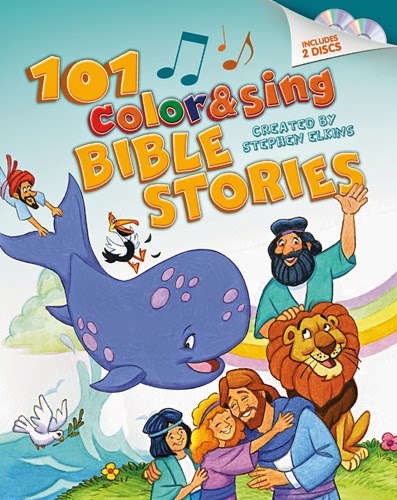 (I spent lots of time pouring over The Bible in Pictures for Little Eyes by Kenneth Taylor, which has since been "updated" with cartoonish illustrations rather than the beautiful artwork of the original.) Even before I could read, I would feast my eyes on the artwork; later when I could read, I revisited an old familiar friend. In spite of this, I've always been drawn to children's Bibles, perhaps hoping the next one I pick up will be as good as the one I remember from my past. They're cheery and cute and appealing, even if I never do become a big fan of them. 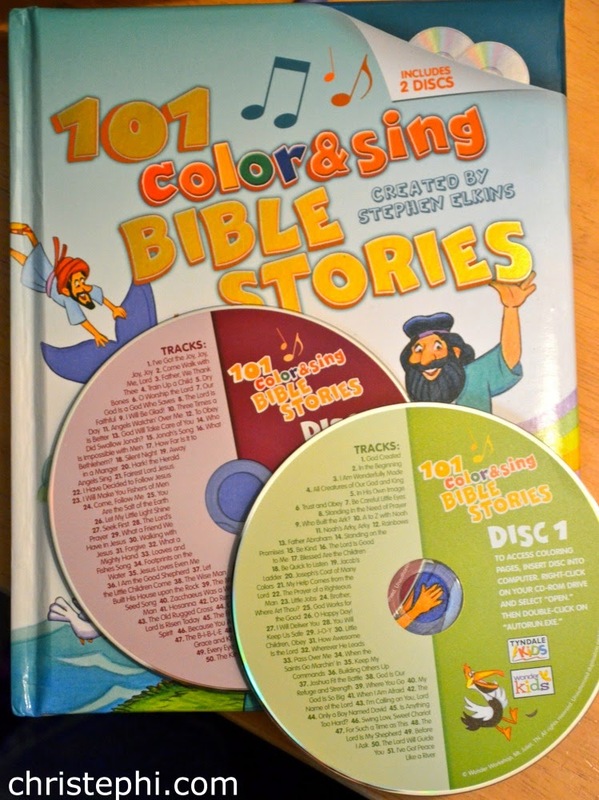 When I received a copy of 101 Color & Sing Bible Stories, I wasn't overly enthusiastic. Still, I vowed to give it a chance and keep an open mind. 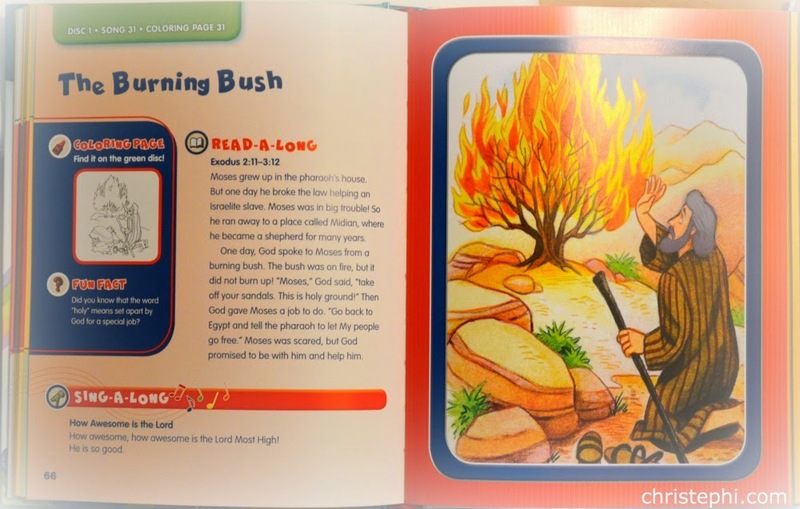 This Bible storybook is a bit different than others I've browsed. Through the use of two accompanying CDs, this book incorporates book, coloring pages, and music -- all things small children love! I have to say, these are some pretty impressive features! And I know for certain my kids will enjoy the coloring pages and songs (even the 7 year old!). If I were teaching Sunday School or VBS or a backyard Bible study for kids, this book would be a tremendous resource. In fact, for preschool, you really wouldn't need anything else (other than crayons, a printer, and a CD player). I accessed the songs and printables on both PC and Mac with no problems at all. The description on Tyndale's website says that each coloring sheet includes a key Bible verse that can be colored along with the picture; unfortunately, that is not the case. The pictures for coloring do not include any words at all. 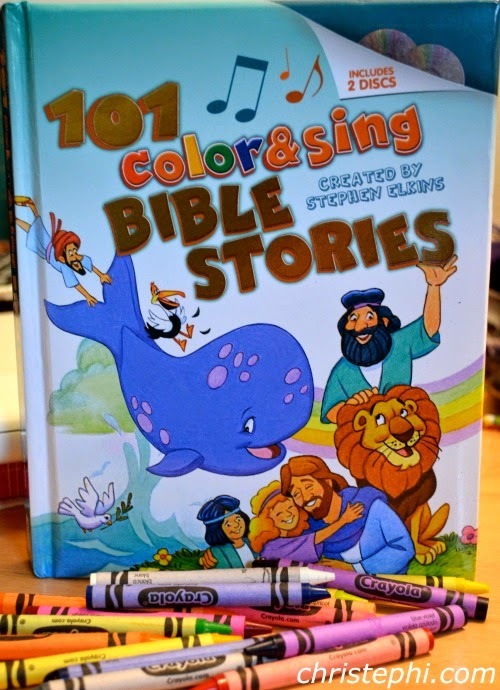 If you were intending this for preschool children, no Bible verses is not really a big deal since they can't read anyway; but if you were planning to use the pages with older kids, it's a bit of a problem. I'd have really liked to see the Bible verses included as the description states. If you're in the market for a Bible storybook, this one is as good as (possibly even better than) any I've seen on the market today. The 101 well-done songs alone are worth the price tag! I received a copy of this book from Tyndale House Publishers for free in exchange for my honest opinion. If you'd like to get free books too, please sign up here.